Read this Miercom white paper to learn how McAfee Risk Management solutions, McAfee Vulnerability Manager and McAfee Risk Advisor, collectively are worth serious consideration for organizations who need an IT security risk solution that brings cohesive means for risk and vulnerability lifecycle management. 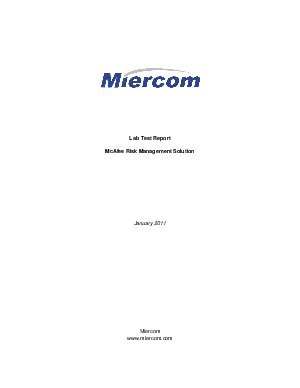 Miercom evaluated the capabilities of the McAfee Risk Management solution -- which included vulnerability management for operating systems, web applications, networks and databases, along with fully automated countermeasure aware risk based prioritization with unified reporting and alerting. If you're looking for a complete option for your IT security, download this white paper to learn how Mcafee can be the solution.